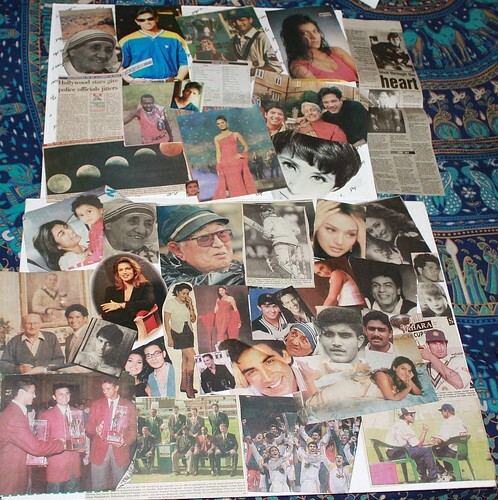 Collage of Nostalgia, originally uploaded by amulya. Today seems to be a day for weirdness. I found this really really really old envelope today. It contained images I had cut out of various magazines and newspapers when I was a kid. I have no clue why I did this but it was nearly 10 years ago I figure and my excuse is - kiddo. It was so absolutely delightful to find it though. I had completely forgotten about its existence!! And man how much the people have changed!!! There is Sachin with Donald Bradman who died quite some time ago. There is a scorecard of a India vs. SriLanka match which I thought ws important bcuz there were some milestones there. Lara Dutta winning Ms.Universe (wow... compare her to the current trash)... the cute singer bros Amaan n Ayaan... Sushmitha Sen with her daughter - one of the first public images i think. And Madhuri Dixit looking stunning, like always... and Kajol... and Keanu Reeves... and MacCaulay Culkin.... and a solar eclipse... Urmila and even an interview of Orlando Bloom. Hilarious!! !